I was so nervous about asking Kit for an interview, she was one of the first artists I hearted on Etsy (via my secret account!) and I suppose I was a little in awe. Silly right (not the awe part obviously)? I am so glad I plucked up the courage to ask and was delighted when I received an extremely thoughtful and intelligently written email in response to my request. 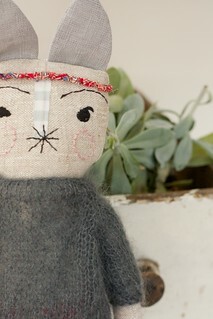 Kit’s beautiful work has a still eloquence, her creatures are so expressive and soulful they transcend cute. It is no wonder that the adoptive parents of the Jacabobs and Bunnies, Ursabobs, Burbles, Nudipeds and Pods become so besotted. Hold onto your hats, let’s enter the fantastic world of Kit Lane. From where do you draw your inspiration: music, books, people, nature etc? Ah, that’s my boy, Lindt, you see above, I haven’t met him in person yet but I know I am about to become a besotted Jacabunny Mummy! Ok, so I am still in awe of Kit, her work, creativity and seemingly boundless imagination. Now, I also know a little more about the woman behind all that creativity and I am so honoured that Kit agreed to share a part of her world with us here at LL&O. Thank you so much Kit for your words and for being such a sweetheart. Yipee! Wasn’t that amazing? Hmm, where will we fly off to next week I wonder, let’s meet again soon curious kittens? This entry was posted in Inspiration, Interviews, Plush News and tagged "soft sculpture", etsy, fiber art, interview, jacabob, kit lane, needle felting, plush art. Bookmark the permalink. Thanks so much for the interview. Her characters are so delightful and having needle felted a little myself I know how much work and finger injuries goes into making these little softies. I think if I didn’t have a day job I could be a little bit of a recluse myself. Great interview and pics! I happened to stumble along Kit’s work via Bubi Au Yeung over at Flickr. Love Kit Lane 🙂 and her interview impresses me a lot ! Enjoy looking at the little creatures. They are whimsical and interesting. I fell in love..all over again. Thanks for sharing! Heya! I love your interviews. Why would you heart via a secret account? Hi Heather, Thank you for stopping by. Good question actually! It isn’t really a secret account, I was a buyer on Etsy for quite a while before I got my shop up and running, when I opened the shop I wanted my Etsy user name to match the name of my little business, Lou Lou and Oscar rather than ‘ishibean’, so I opened a second account, less confusing for buyers I think!